The Rebel Sweetheart. 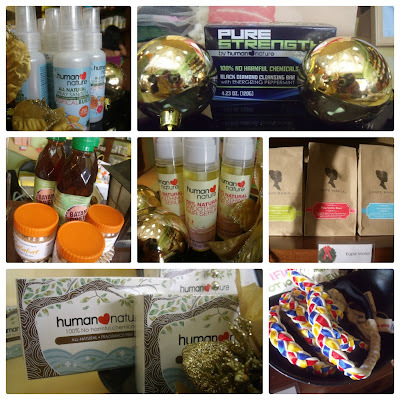 : Events | Human Heart Nature Laguna Product Launching + Organic Market Bazaar. Events | Human Heart Nature Laguna Product Launching + Organic Market Bazaar. The atmosphere was truly fun and festive at last week's Product Launching and Organic Market Bazaar. The moment you set foot on G-Square Plaza, where the bazaar was held, you will be greeted by jolly old Saint Nicholas - a throng of them! These cute Christmas decors are proudly Philippine-made, and crafted from recycled materials. Mommy Bubbles and Mama Cherry. Fresh greens were also abundant at the bazaar. These herbs, spices, and produces are all organically homegrown from Mr. Ato Belen's farm. Organic chicken and tofu were also selling like hotcakes during the event. Also available at the bazaar were bath and body products, household items and natural remedies. Fruit juices, herbal coffee, and all-natural pain reliever. Handmade soap, and other bath and body products. The mood was even more Christmas-y as you step inside the Concept Store. Human Heart Nature Laguna has decked the halls and is dressed to the nines! Even Ms. Elaine is imbibing the Christmas spirit. Check out her Santa hat! Product launch / magalogue turnover proper. But the star of the show are no other than the new products, which can be found at the Christmas 2012 Magalogue. Top L-R: Tropical Burst Spray Sanitizer, Pure Strength Diamond Cleansing Bar. Middle L-R: Bayani Brew + Salabat, Smoothing Hair Serum, Kape Maria. Bottom L-R: Natural Cleansing Bar, Pilipinas Headband. These new products are now available for purchase, together with the all-new Christmas Bundles. Visit a Human Heart Nature branch near you, or you may opt to order online. I'll be doing a review of these new products real soon, so please watch out for it. Hair Serum + Herbal Pillow. Thank you, Human Heart Nature Laguna! And congratulations on the successful Product Launch! Until the next Magalogue Turnover! The Santas look great, and I love Handmade soap!!! I was impressed by the creativity and health-focus of these beautiful, hand-made products. It's also always fun to see an on-the-ground perspective of places that are far from where I live. I would so love to visit the Philippines some day. One of my close friends is from there. I love the fact that the Santas are made of recycled materials! They look great too. Looks like a wonderful event,thanks for sharing! I own Human Nature products and I actually love their whole product line! oh! I miss this one, my sister forgot to advise me. Well, I love going to bazaars and especially organic markets like this one. I am a fan of Human Nature as well, an avid user of the strengthening conditioner. The Coco Natur oatmeal soap is my fav also. Hope there will be next time. Seoul Searching | Mad about Myeongdong. Summer 2019 | Workshops and Classes for Kids and Teens. Wordless Wednesday #112 | Happy Birthday to Me! Spotlight | The Face Shop Lovely ME:EX Makeup Base. Spotlight | Precious Herbal Pillow. Join | XBox Holiday Bundle Giveaway! Wordless Wednesday #15 | Shopping, and then some. Sign-Up | Palawan Hidden Hills Getaway Giveaway. Sign-Up | Mia Mariu Giveaway Event. Join | Girls' Dream Christmas Giveaway! Join | Boys' Christmas Giveaway! Join | iPad Mini Giveaway! Wordless Wednesday #14 | Dr. Seuss! Sign-Up | Have It Your Way Giveaway. Foodie Goodie | Cakes by Issa Aguilar. JusTees for PAWS, for the love of Stalin. Wordless Wednesday #13 | Four the Win! Nailed | Sassy Colors Magnetic Nail Polish. Spazz Saturday #10 | Happy Pepero Day! Join | Step2 Deluxe Art Master Desk Giveaway! Join | Whatcha Want Christmas Giveaway! Foodie Goodie | Doowee Donuts. Today's Look | Smokey Eyes ala T.O.P! Join | LG Smart Magic Bigscreen Giveaway! Join | It's in the Bag Giveaway! Win $500 in the Christmas Cash Giveaway! Cetaphil Brand Ambassador + Skin Treats Promo! Foodie Goodie | BonChon Chicken! Join | Choose Your U Giveaway!